Driveshaft Shop is proud to introduce their new 2-piece driveshaft for the Evolution X. This shaft uses an Aluminum front section with a Chromoly rear section with a specially designed hanger bearing and bracket that eliminates the violent hanger lag that occurs when power is put through the factory shaft. The weight on your driveshaft is 33LBS plus the weight of the hanger bracket which is 1LB. 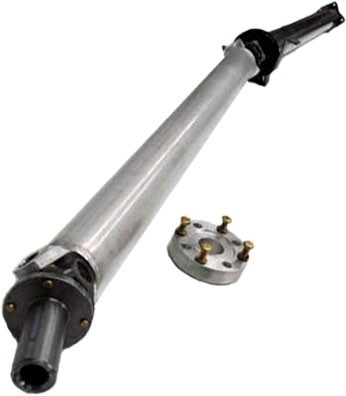 This driveshaft uses a 1 hanger bearing, instead of the 2 on the factory shaft, and features greasable/replaceable u-joints instead of the non-serviceable type on the factory shaft. Also includes an Aluminum conversion plate for the rear and all necessary hardware to make this a bolt-on affair. These are Driveshaft Shop's aluminum drive shafts for the EVO X.